Often seen at sushi restaurants, aka-gai ("red clam") look like flower petals, starting out white at the base and turning bright red at the pointed tip. Although they are available year round, the best season is April & May. 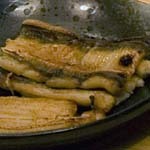 Anago are saltwater eels, somewhat similar in taste and texture to unagi (freshwater eel). The best anago are caught near Haneda in Tokyo Bay. 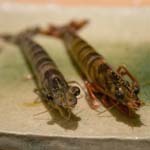 Anago is used for sushi, where it is usually boiled to get rid of excess oil, and then roasted and covered with a sweet sauce. 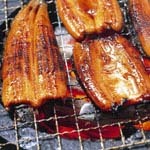 Although precooked unagi is available at Japanese markets, anago is rarely available. 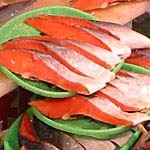 The process of sun-drying fish has been in place since ancient times as a method of preservation. 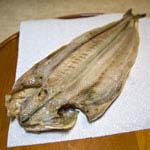 While some fish are dried completely, to be used in soup stock or reconstituted and simmered in soy sauce, larger fish such as shima hokke (horse mackerel) are gutted, opened flat and then salted and hung to dry in the sun and fresh air until they lose 50% of their original moisture content. 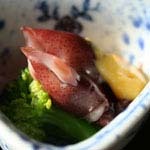 This method has the effect of firming the texture and intensifying the flavor of the fish. Amino acids are present in greater quantities in himono, adding a depth of flavor and improving its nutritional content. If you have ever had the opportunity to broil freshly caught and filleted fish, you know that a lot of water is given off in the cooking process. Sun drying serves to lock in the taste while getting rid of excess water. One of my friends does this every January, when the air is cold and dry enough. She hangs fish in netting on her apartment balcony in Tokyo! I can’t imagine doing something like this in Chicago, and besides, himono are packaged ready to grill or broil, for ridiculously cheap prices in the refrigerated section at my Japanese market. She insists, however, that the effort is worthwhile for the superior flavor. These migratory fish, from the mackerel family, are known for being fast swimmers, even swimming in their sleep. They like warm water, so they are found in late March in Kyushu, migrating to Hokkaido in June. When they return south in autumn, they are enjoyed for their high fat content and buttery flavor. Kastuo no tataki is the most common way to prepare it; pieces are charcoal-grilled over a high flame, but the center is still raw. 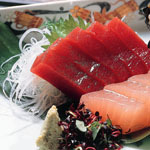 Although the Japanese were eating tuna for over 10,000 years, its popularity is relatively recent. Its red or pink color and heavier flavor were better appreciated after the introduction of meat in the early 19th century, and after the production of soy sauce, which goes particularly well with it. It wasn’t until the end of WWII that the fatty belly became more valuable than the leaner back portion. 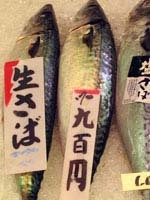 Akami, meaning red meat, is deep red and comes from the lean top part. It is sometimes available at regular grocery stores in vacuum sealed packages. 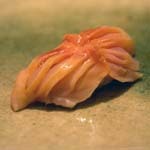 Chu toro (medium toro) is the next grade up: it is pink and has a higher fat content. O toro (big toro) is the most expensive cut, taken from the lowest part of the belly next to the head. In the states, it is hard to find, but when available, it costs more than $50 per pound. Its buttery texture literally melts in your mouth, and is one of the joys in life. 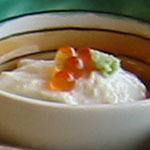 Similar to fish balls found in Thailand and Vietnam, neri-mono are made of white-fleshed fish, such as flounder, that is pounded, pureed and seasoned with salt & sugar and then steamed or fried. Chikuwa looks like a hollow sausage. The hole comes from the way it is made- with the paste formed onto bamboo sticks, which are then steamed and broiled. The broiling forms a thin golden “crust” that is not crunchy. 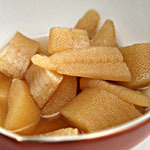 It is delicious in hotpot dishes such as oden. 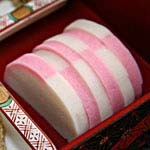 Kamaboko is formed into half rounds on small wooden boards. It is usually white, but can be found tinged with pink edges, especially during festivals like New Years and during cherry blossom season. Kids like its mildly sweet flavor and texture. 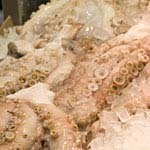 It is cut into slices and eaten plain, without sauces or added seasonings. 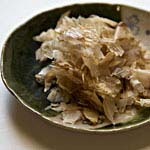 Satsuma age, named for the Kyushu area it comes from, is fish paste that is formed into various shapes and fried. It is also a nice addition to oden. 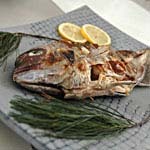 Tai is considered a special variety of fish – elegant in form, it is the centerpiece of the all-important Oshogatsu New Year’s celebration, roasted and served whole. 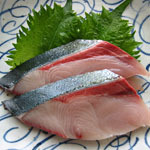 Tai is somewhat similar in appearance and taste to red snapper, and is hard to find at Japanese grocery stores, apart from at this time. The flesh is white, with a delicate and sweet flavor. The season runs from winter to spring; a delicious (if puzzling to westerners) spring dish is tai heads simmered in sweet ginger and soy broth. Being a large fish, normally over a foot long, the heads can be 6" to 8" wide and contain ample meat. 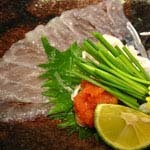 Tai is also delicious raw in sushi and sashimi, where it is considered a treat. It is low in fat and high in vitamin B1.